Here's a peek of my design wall today. Baby Safari is well under way. I cut a bunch of charm squares from the fabric stack I showed you earlier. I really love these colors together, especially for a baby quilt. They are so warm and happy. I had the charm blocks done and on the wall and the quilt was telling it needed a little something more. The animals in the main Central Park print are so cute so I fussy cut a few and framed them with scraps. It took a little figuring getting each one to fit into a 5"x5" grid. Remember when I did the Fat Quarterly quilt along? I hope you all have a happy weekend. Sew something will ya? Adrienne, this is so cute! Love the quilting. Have you already washed it? or did you double bat it? You are "boogalooing" along on this one;)lol! Funny you bring up Where's Waldo! I introduced my son to the Where's Waldo books the other day and he is head over heels with them! 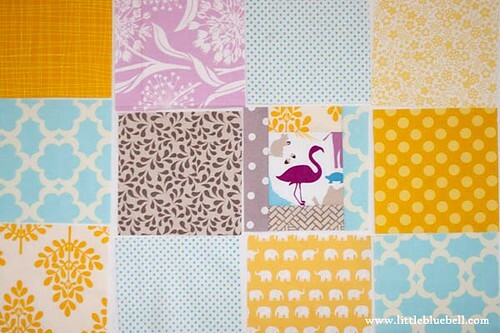 this is going to be a cute quilt! happy sewing! maybe i should say "happy speedy sewing"! I've never said that before but I sure will now!! love it! 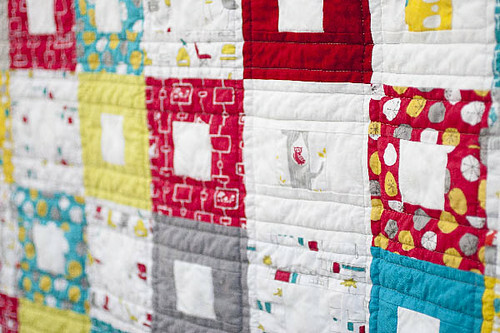 Great baby quilt, love the where's waldo idea! The Central Park prints are so nice. Very cute quilt. So sunny and warm. I love the fussy bits Adrianne! Love the fabrics and it really looks cute!